If you read last week’s post about my quest for summer potluck recipes, cure then you’ll understand where I’m coming from here. This summer’s been chock-full of BBQs and potlucks and I’m in serious danger of repeating a recipe – something that makes me very very sad. So, pills instead of serving the same old thing, illness I came up with another summer side. Though some people hate on coleslaw, I think it’s great. It’s cool and crunchy and a nice way to balance the piles of grilled meat that usually make up the centerpiece at any BBQ. I like to use some green apple in my coleslaw because it adds a sweet crispness to the dish. This time I also used slivered almonds for crunch and instead of straight mayo, I made a vinaigrette with olive oil, mayonnaise, lemon juice, apple cider vinegar and poppy seeds. It’s lighter and brighter than the standard and goes great with the apple. I know meat is supposed to be the main event when you’re grilling, but sometimes the sides just steal the show. Whisk the dressing ingredients together until well combined. Place the apple and cabbage in a big bowl and toss with the dressing. Cover and let stand for about a hour. Just before serving, toss in the slivered almonds. A very similar recipe for this was published in the June 2001 issue of Bon Appetit. I know because I have made it many times for parties. My guests rave and all want the recipe, so it must be delish! Yum! 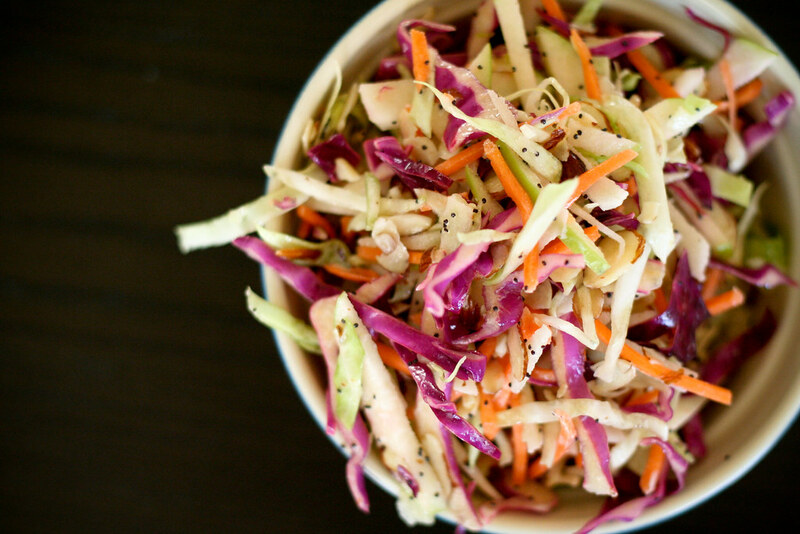 I love the pretty colors in this coleslaw. Wow, this looks fantastic! 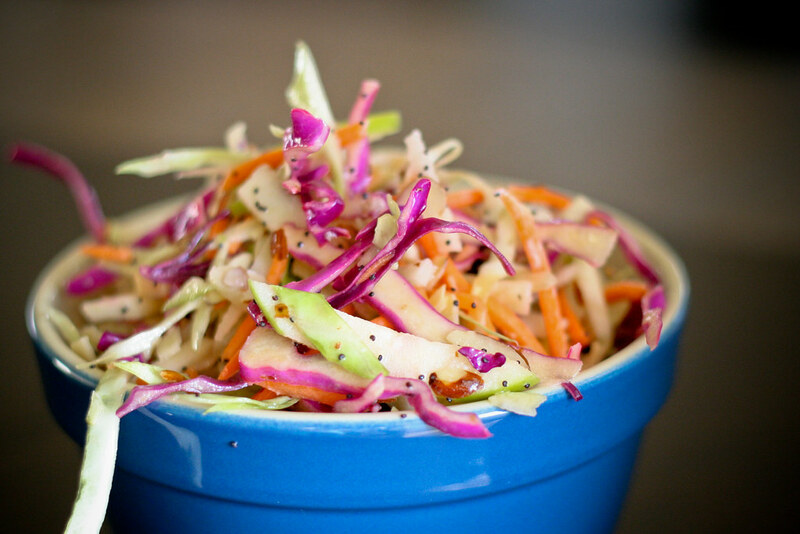 I never thought to put green apple in slaw – such a great idea! this looks like a winning salad…I can imagine the freshness and crunchiness of the apples and almonds…and adding poppy seeds is so unique! Ill have to try this recipe, I keep buying my slaw dressing premade. Great photography too. I love the color and the little accent of the poppy seeds and can see this cheerfully sitting next to a delicious pile of BBQ pulled pork. As a vegetarian, I’m all about the sides and love the person who brings something new, yummy & interesting to the BBQ. Looks like you nailed it!